Jim Teegarden has an extensive background in helping successful entrepreneurs and business owners reduce taxation and grow their wealth. Jim earned a B.S. in Industrial Technology and Distribution from Purdue University. While in college, Jim served four years in the U.S. Army Reserves and National Guards, respectively, as both a combat engineer and stinger missile gunner. He was also heavily involved in Sigma Pi Fraternity, serving as chapter president and in many other executive leadership positions. Jim worked for a Silicon Valley computer controls firm after college, serving first as an application/sales engineer and then as a sales manager for the tire, rubber, plastics and aluminum rolling industries in North America. He started his financial career with Cigna Financial Advisors (now Sagemark/Lincoln Financial Advisors), focusing on solving complex estate and business transfer problems for wealthy business owners. After much early success in this area, Jim formed Spectrum Financial Network in 1997. He has since been heavily involved in providing sophisticated tax and investment strategies to high net-worth families throughout the country. He has spent a tremendous amount of time with the top planners, financing companies, and legal and accounting firms in the country, developing and marketing sophisticated planning solutions for wealthy family groups. In 2004 Jim founded Teegarden Financial Corporation allowing him to focus on the benefits of combining the traditional capital markets and life insurance through innovative financing strategies. Since 2005, TFC has placed approximately $1.5B of new life insurance, and has generated over $35M of profits for clients through these techniques. Jim is actively involved in his church and various charities. He served as the capital campaign chairman for the Denver-area Ronald McDonald House building project, and was influential in securing the funding for their $7M+ house which helps families by providing little to no cost lodging while their children are hospitalized. Jim is also an active member of the Board of Directors of the Rocky Mountain Christian Academy, a classical Christian private school. His extensive charitable involvement also includes membership and financial contribution in Rocky Mountain Christian Church, Young Life, Family Life, Student Venture, Cross Ministries and the Alliance for Choice in Education. Outside of work Jim enjoys reading, golfing, running, snowboarding, hunting, fishing and other sports and outdoor related activities, and most of all spending time with his family. He coaches youth lacrosse, football and basketball. 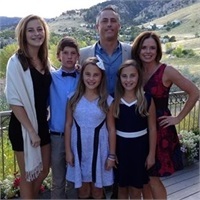 He and his wife Heidi have lived in Boulder, CO since 1996 and are the proud and busy parents of four young children.